You can expect to find high-quality triplex pumps and reliable induction motors on all these professional electric hand held power washers. 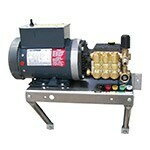 These professional components, along with a superior warranty, should provide you with years of reliable use. 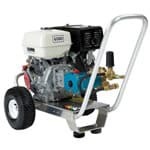 Equipped with conveniently-placed handles, you can bring these pressure washers wherever you need to clean (as long as it's within 35 ft. of an electrical source). 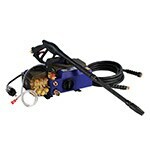 Body shops, kennels, vehicles and more - electric hand held power washers will clean these things in no time. If you're looking for an electric pressure washer you can use everyday, electric cold water pressure washers are for you. They're on sturdy wheeled carts so you can move them around easily. The electric motor doesn't produce carbon monoxide emissions so you can safely use these indoors if you need to. With PSI ranging up to 4000, these pressure washers are no slouch when it comes to cleaning capabilities. Stained concrete? No problem. Moldy siding? You bet. The units over 3000 PSI even have enough power to strip paint. Welcome to the world of hot water pressure washing. If cleaning areas with grease or oil is a requirement, hot water is the only way to go. With temperatures as high as 200⁰ F, you can accomplish some serious cleaning tasks with a professional electric hot water pressure washer. A lot of these units require 230 volt electricity, which requires a double throw circuit breaker. Without it, the pressure washer is useless. However, with this power, cleaning greasy kitchens or garage floors caked in dirty oil is a snap. 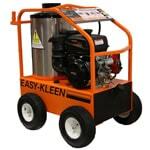 Electric wall-mount pressure washers are your best bet for stationary cleaning needs. Just attach it to the wall, plug it in, and you'll be power washing big messes in no time. Make sure you have the necessary electrical capability to run these, as some require 220-volt, 3-phase power. Wall mount power washers are most commonly found in monster garages and places like car dealerships where they clean a lot of cars. Another frequent use is in restaurant kitchens, where you can't have dangerous carbon monoxide fumes. Get a warm water unit and some degreaser and your kitchen will be looking like new.